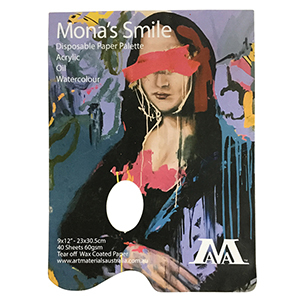 The Mona’s Smile Paper Palette is 9x12 inches in size, 23x30.5cm and roughly 2cm thick. The pad consists of 40 sheets of wax coated paper that is 60gsm in weight which will give you absolutely no bleed through of wet media. The Mona’s Smile paper palette features a hard boxboard back which makes the palette rigid and comfortable to hold. There is a thumb hole cut in the bottom of the palette, making it very similar in feel and look of a traditional wooden palette. Each of the 40 sheets is glue-bound at the top of the pad for easy tearing and disposal. The Mona’s Smile disposable palette is great to use with acrylic, gouache, oil and watercolour paint. The paper provides an excellent mixing surface; Paint brushes, colour shapers and palette knives can be used on the palette. Great for the studio, art class environments and plein-air painting. Just tear off the sheet once used, fold it up and throw it away. No paint down the drain! The 9x12 inch Mona’s Smile Paper Palette fits beautifully into the Van Gogh’s Ear Woodshed Box easel, paints, drawing pads, small canvases and paint brushes will also fit into this transportable box.